Since many tools are used that can run standalone and exchange various data in various formates many things can go wrong. To get a good overview and troubleshoot it is good to spend some time and run everything using the command line. To work in the console a text file describing the schematics need to be created. Those files have usually cir as file extension. The files start with a title line and end with .end. * is used to mark a line as comment. The term node is used for the electrical wires between the components. For the simulation it is important to name a node gnd (or 0) since many things default to gnd and therefore the simulation could fail. The lines start with the type of the component used with a number attached in case of multiple types. The follows a list of nodes where the components pins are attached. Finally a list of values that describe the characteristics follow. Some desired actions can be put in the file as .tran to define the transient analysis, the parameter following are the time between calculation steps, and the end time it is good to use units as e.g. 1ns for the step time. There are more options as adding a third time as start time to not see the initialization. Some components require a .model definition to set additional characteristics this seems to be necessary for junction transistors since the letter q does not specify if it is a PNP or a NPN type. ngspice test.cir starts ngspice with the cir file and ends in the spice console. On the prompt type run to run the simulation. plot base will plot the node base (alternatively the command gnuplot<output filename> base can be used). A picture can appears that can be plotted as ps. op runs the DC simulation where print base gives the DC voltage on the node base. The command edit allows to modify the loaded file listing shows the input file Finally quit exits the spice shell. Many programs to be used come from the http://wiki.geda-project.org http://wiki.geda-project.org/. 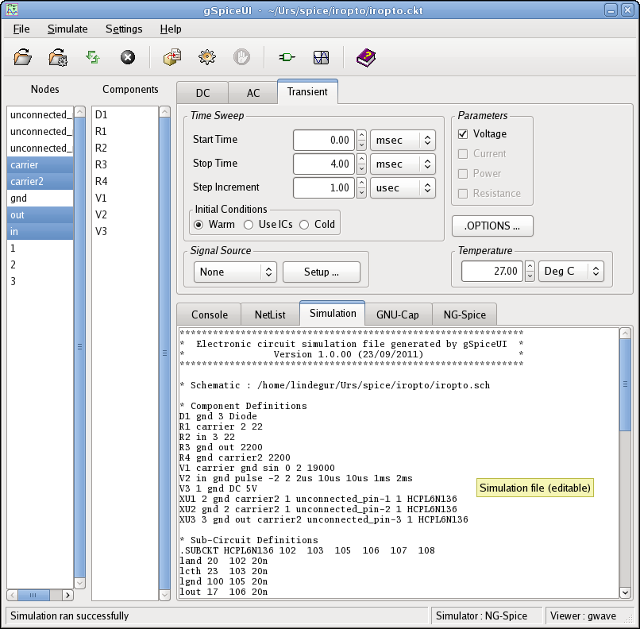 An alternative of ngspice is gnucap, that is also supported. To use the schematics there is gspiceui. However gspiceui makes use of many other programs as ngspice (alternatively gnucap), gwave, gschem and makes mandatory to understand how the data is exchanged between those programs. Knowing that, allows also semi gui way by having multiple windows open and work partly in the console. Inside gspiceui there is also a console where the commands and their responses can be observed. A .cir file used by spice has not all the information a schematics has, especially the 2D placement of the components, so an editor as gschem has to be used to draw a schematics and then imported in gspiceui. gspiceui does the creation of the cir file in two steps. When importing, it creates a file with that has .ctk extension. This file holds everything a cir file has except the simulation commands, that obviously do not come out of the schematics. The schematics must hold all necessary spice characteristics so check the automatic created spice file (net list) to see what it got. Add the attribute netname gnd to the ground, since without gnd it is highly probable that the simulation will fail. The spice component library in gschem holds the necessary components as power sources. Attributes have to be added to the components until the space behavior is fully defined. Those models are not enough to model integrated circuits. However integrated circuits can be modeled using those models. Any circuit including integrated circuit can therefore be defined as sub circuit and can be put between .SUBCKT <name of th IC> <list of pins> and .end. The .end <name of IC> can have optionally the component line to see to what the .end belongs to. For most of IC those spice models are available through the IC manufacturers, however they can be more or less precisely. Luckily those complex .subckt files from the manufacturer can be kept apart from the schematics. The link from the schematics to the .subckt file is done by setting the file attribute in gschem. Additional the model-name attribute needs to be set, since the file might contain multiple devices. The number of pins and its sequence need to match between schematic file and spice model, this is often not the case since both file have mostly different authors. What is still missing are the type of simulation and its parameters to be performed, this can be set via the simulation tab. The a complete cir file with the extension .ckt is created and the simulation can be started. After the simulation has finished a ASCII file with .tr for transient is created. Inside the console of gspiceui just the first 1000 lines (as defined in the preferences) can be observed. Additionally the preferences allow an automatic delete of the simulation output files. Simulation results can be observed using the wave form viewer gwave (or alternatively gaw gtk analog wave viewer). gwave can be started within gspiceui or as standalone application. It does not make use of the ASCII file with the .tr extension. It works with raw format. Or http://tams-www.informatik.uni-hamburg.de/applets/hades/webdemos/index.html java -jar hades.jar additional to button led simulation it also supports wave forms. Irsim is a digital simulator http://opencircuitdesign.com/irsim/ on level of transistors but not circuits. It treats transistors as ideal. A good digital design does not make use of non ideal situations. 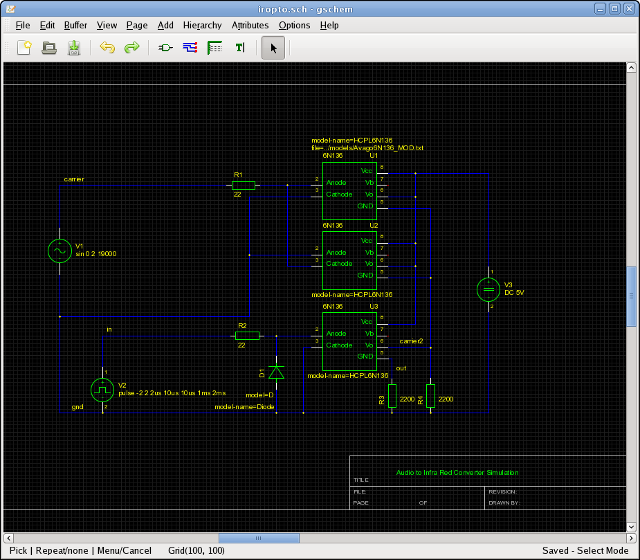 Again, this simulator requires a .sim text file, xcircuit http://opencircuitdesign.com/xcircuit/is a tool to draw schematics and then export them to irsim.